The #1 tourist attraction on the Sunshine Coast is the world-famous Skookumchuck Narrows Provincial Park hike out to see the Sechelt Rapids. This trail starts 2 blocks from Bathgate Resort. For information on how to time your trip in for the best views, please click here. 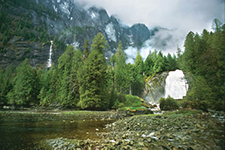 The #2 destination is a bit farther out but extremely popular due to its remote beauty and signature destination: Malibu Rapids, Princess Louisa Inlet and the stunning Chatterbox Falls. Tours depart daily with our activities partner Sunshine Coast Tours - reserve online.